There is one young designer to watch in Singapore: Priscillan Shunmugam and her label Ong Shunmugam. She's already made a name for herself with her match and mixing of Asian fabrics and her contemporary take on traditional Asian costume like the Qipao. With her latest collection, she mixed Indonesian batik, Thai songket brocade, kimono fabric, to create a collection loosely inspired by the historic heritage buildings of Singapore. Unveiled at the Audi Fashion Festival in Singapore, the collection titled “Whenever I Fall at Your Feet” showed Ong Shunmugam maturing as she moved away from her twist on traditional Asian costumes, such as the sari and the qipao, to create more personal and daring garments that expand her design vocabulary with asymmetric sleeves and necklines, while still retaining their strong Asian flavor. As the designer put it, her fifth collection “digs deep into the past to uncover the future.” It offers structured silhouettes with her signature “print-on-print” that at times sharply contrast yet harmonize thanks to the use of narrow strips of the same printed fabrics that create interesting detailing and highlight the structure of her garments. 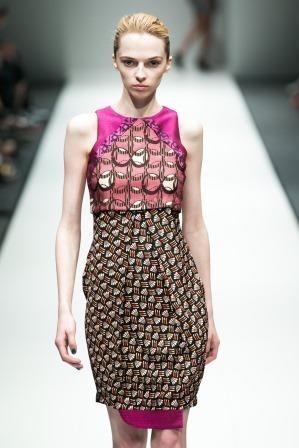 Of note are a fuchsia mini-dress with a wrap-around skirt and pointing edges, armor-like shoulders, and a fetching sewn-on belt wiht rectangular pattern, and a very feminine blue dress with a small pleated skirt that starts below the hips. The collection will be exhibited at the National Museum of Singapore in July.